At Reaper Pest Control our aim is to ensure that your business complies with current pest control legislation and recommended best practices. We offer a pest control service at times to suit your business including out of hours arrangements. Cowdenbeath, Edinburgh, Kinross, Kirkcaldy, Dunfermline, St Andrews, Cupar, throughout Fife and also the West Lothian area. 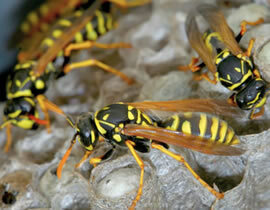 Reaper Pest Control will quickly deal with your pest problem. Our intention is to minimize the health risks and protect you, your business and your customers. We provide a rapid response to business pest control emergencies in all areas of Fife. Our mobile pest control technician will visit your business, investigate and solve the problem usually in one visit. Reaper Pest Control have a 24 hour emergency call out service covering the Fife area. Call 07591 035288 for details of our pest control solutions and 7 Day / 24 hour call out service. Call today if you have pest control problems such as a wasp nest, mouse or rat infestation, moles in the garden, flies, fleas, bed bugs, ants, cockroaches, pigeons, bed bugs or any other pest problems in Fife.